Just days after a string of national press reports in January highlighting the CHRONIC FINANCIAL PROBLEMS of Multi-Academy Trusts across the country, parents of Hillcrest Primary in Totterdown were informed that the school had quietly approached the Regional Schools Commissioner to form a MULTI ACADEMY TRUST (MAT) with Holymead, West Town Lane & Whitchurch Primaries. Accompanying the announcement, a set of dubious claims were LEAKED out to parents to justify the idiot plan. Claims that include ludicrous financial assertions for MATs with little basis in reality. One claim is that academies get “MORE MONEY” than local authority schools. They do not. Funding per pupil is the SAME for both types of school. 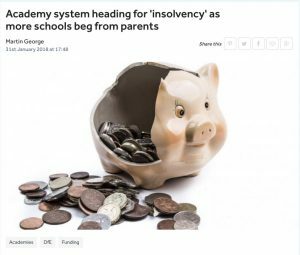 Another claim is that the academies will “SAVE MONEY” because the school will not have to pay any money to the local authority for shared services. Partially true. Although the school will have to pay money to the MAT instead. Savings, therefore, will be somewhere between very limited, zero or more than they’re paying now depending on how the MAT and its OPAQUE and UNACCOUNTABLE trustees, members and self-styled leaders choose to set their charges (and significant personal salaries). The only possible way academies can spend more money on your children is if they DRASTICALLY REDUCE teachers’ and staff pay and conditions – any schools’ biggest expense. This means an assault on maternity, paternity and sick pay, more use of unqualified and newly qualified teachers, less staff with larger classes, poorer SEN provision and much more. Otherwise, these academies are BARELY SOLVENT. A glance at the accounts for West Town Lane, which is already an academy, reveals the school has just £200k in reserves and a capital buildings budget of just £25k per year. £200k is enough to pay staff for ONE MONTH. While the school is just a new roof away from BANKRUPTCY. Why are local schools rushing down this academy route then? Or more to the point, why isn’t our Labour-run authority doing more to warn NAÏVE SCHOOL GOVERNING BODIES of the dangers of this DAFT TORY INITIATIVE? And what, exactly, is the Reverend’s cabinet member for schools, Anna “The Ostrich” Keen, whose main qualification for the job appears to be that she’s the Reverend’s old geography teacher’s daughter, doing about it? The Ostrich needs to get on top of this issue. Otherwise people might end up thinking that the Reverend and The Ostrich are launching a vicious Tory-style AUSTERITY ASSAULT on teachers’ pay and conditions in Bristol using school governing bodies as cover to deflect the blame away from themselves. Not the kind of dishonesty the Reverend Rees’s would ever get up to, surely? This entry was posted in News and tagged Anna Keen, Bristol City Council, Hillcrest Primary School, Holymead Primary School, MAT, Multi Academy Trusts, TES, West Town Lane Academy, Whitchurch Primary on March 28, 2018 by thebristolblogger. The ‘begging from parents’ bit is the key to all this. One day no doubt we will have the prestige Trusts who charge parents fat fees and the pauper’s schools where everyone else is expected to shiver in a Portakabin. Fifty and more years of building a fair system flushed away.